Fire clay or terra-cotta pipe, either round or square, usually in 2-foot lengths of varying size, used for the inner lining of chimneys. 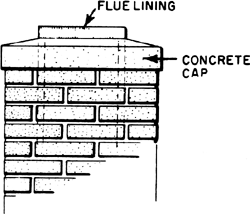 In a chimney flue, a lining consisting of special heat-resistant firebrick or other fireclay units, heat-resistant glass units, or special concrete block; used to prevent fire, smoke, and gases in the flue from spreading to surroundings. The main house has been recently refurbished to include a new boiler and central heating system, new loft insulation, new carpets, new woodburner and chimney flue lining. Chimneys should be professionally swept twice a year and chimney brickwork and flue lining inspected regula rly. industry comprises establishments primarily engaged in manufacturing clay sewer pipe, drain tile, flue lining tile, architectural terra-cotta, and other structural clay products. One of the important functions of the flue lining is to serve as an insulator between the hot flue gases and the chimney wall. The clay building material and refractories manufacturing industry comprises establishments primarily engaged in manufacturing: brick and structural clay tiles (NAICS 327121); ceramic wall and floor tiles (NAICS 327122); other structural clay products such as clay sewer pipe, drain tile, flue lining tile, architectural terra- cotta, and other structural clay products (NAICS 327123); clay refractory manufacturing such as mortar, brick, block, tile, and fabricated clay refractories such as melting pots (NAICS 327124); and nonclay refractory, mortar, brick, block, tile, and fabricated nonclay refractories such as graphite, magnesite, silica, or alumina crucibles (NAICS 327125). Such was the inefficiency of smelting that flue linings were frequently scraped and the residue (20pc lead) re-processed.